According to the Content Marketing Association, it’s now the single biggest channel in the marketing mix and an industry worth more than £5billion in the UK alone. It’s also cost effective: according to consultancy Demand Metric, content marketing generates about three times as many leads as traditional marketing and it costs 62% less. But with every brand and its dog churning out content, there’s a lot of noise for consumers to deal with. It’s estimated that, on average, we’re bombarded with around 10,000 messages per day. Now that audiences are faced with more choices than ever before, the balance of power between businesses and consumers has shifted. Brands need a more sophisticated approach to stand out from the competition – and relevant, consumable content is the new currency to fulfil this by providing tangible added value and a satisfying customer experience. How can you cut through the content marketing clutter to grab your audience’s attention and influence their choices? If your content marketing activity meets all of the criteria below, you’re primed for success. It provokes a reaction, whether that’s contacting your company for more information, visiting your website to make a purchase, or sharing it on social media. The best content has the ‘shareability’ factor, which spreads your brand’s message further with your customers doing the work for you. It’s an important feature in content marketing as people are more likely to trust recommendations from people they know than from a company. It’s also easy to measure on social media platforms and therefore used by many marketers as a success metric. While the ultimate objective is, in the words of the Content Marketing Institute, to “drive profitable customer action”, this shouldn’t be your only goal. Content marketing isn’t simply about pushing a sales message: your content needs to be well-researched, high quality and offer unique benefits. Think about how much information you’re bombarded with online – what makes you stop and take notice? To engage people’s attention, your content needs to offer something that’s both original and that really appeals to your audience’s interests. The format, platform and timing are just as important as the subject matter (the how, where and when); the key to success is relevancy. This is why it’s so important to know your customer. Rather than going after a short-term win, such as making a quick sale, successful content marketing focuses on the long game of building up trust and awareness, so that your brand is front-of-mind when a customer decides to make a purchase. These are the basics. If you want to get into the nitty gritty of why some content works and some doesn’t, and devise content marketing strategies that deliver consistent, predictable results, you need to know how to accurately montor and evaluate success. 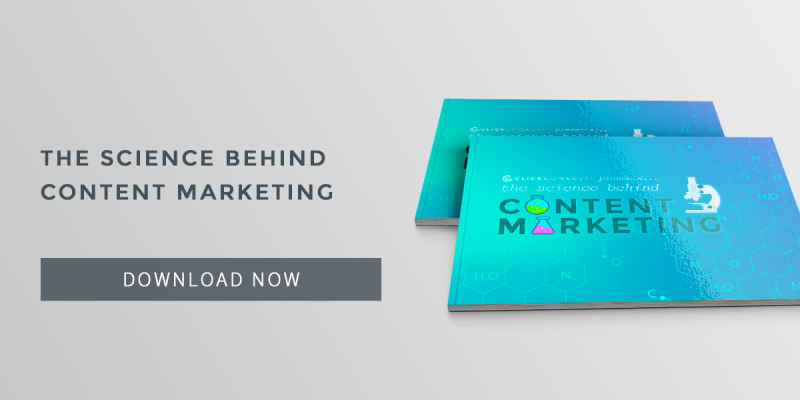 The Science Behind Content Marketing eBook walks you through the process – click below to download it for free. Contact us for more information about our award-winning content marketing and campaign services.